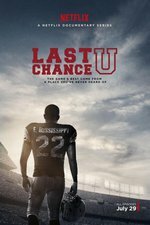 "Last Chance U" follows a group of young men training to become the future stars of the NFL. Based at East Mississippi Community College (EMCC), "Last Chance U" takes us on a journey to understand the real men of the gridiron at one of the most successful, but least known athletic programs. Each player has incredible talent and drive to be the best, but each face their own unique struggles both on and off the field. The EMCC Lions play in the NJCAA Division I, and have become a home for those players who haven't been able to make the grade - academically, behaviorally, or in terms of performance - for higher level play. The program aims to help these players make it to a higher level, and to crush the junior college opposition along the way. The first season of Last Chance U follows the EMCC Lions 2015 season, where the team attempts to capture its fourth national championship and third in a row. I'm not a huge fan of college football; in fact, I watch very little football at all these days at whatever level. That said, I found this a fascinating look at the people and personalities involved with the program at EMCC and the way the season ends is difficult, for a lot of reasons. I also found the level of access that the film crew got was pretty remarkable; this was not a PR-guided loving documentary of a football team, but rather a pretty raw look at what goes on both on the field and off for the players, the coaches, and some of the other people involved. After I saw this recommended in an article I've been catching up on it over the last few weeks... I'm British but watching a lot of NFL games back in the day kept me up to speed with the on-field action. The stuff on US education system was a bit more opaque but I just about managed. It's a fascinating character study... especially the difference between the two B's Buddy Stephens and Brittany Wagner. Were they ever in a scene together? Brittany is obvious loved by her students... Buddy not so much. To be honest I honestly could not see any qualities of great coaching there. His rants were entertaining but I can't see how they would be really effective. I'm sure the team did as well as it did due just being about to get hold of a lot (or at least enough) really good players, to make a difference. I'm into the second season, and my memories of the first are becoming hazy I cannot recall Buddy and Brittany ever being in a scene together; she certainly seems to interact with the other coaches as well. As much as I like Brittany - she's the obvious heart of the program - Buddy is an interesting figure...he certainly seems to lack the interpersonal skills I kind of expected for this type of program, and I feel like there's almost two people there: the Buddy who rants and swears and is on full display in the immediate aftermath of the season ending brawl; and another, softer Buddy who we see snatches of with his family and in his apology to the team. He just doesn't know how to reconcile the two, if that makes sense. I think there's a few sites out there that can update you on the various outcomes for the people featured, in terms of where they went next. Once I'm through the second season, I'll throw up a thread for that too. Buddy is definitely an interesting figure... probably his reactions post-brawl are excusable. It most be something to see all your hopes and dreams for the last year (and possibly your future job) vanish in a few seconds like that. probably his reactions post-brawl are excusable. His frustration, certainly. His language choices were alarming; it is really quite...illuminating when a middle aged white man calls a group of predominately black men "thugs". I finished it up as well and I'll get a thread going for S2, just so we keep discussions separate for others moving through. yes, I initially didn't pick up the 'thug' / 'ghetto' stuff... but eventually saw why that did not go down at all well. I've just finished watching season 1, and I found it a fascinating show. Even though I have no clue about the NFL, and am finding the US education system very confusing. On to season 2 now.